Small and medium enterprises (SME) have attracted increasing interest in the last few years, and industrialization is no longer seen as a linear way of development. 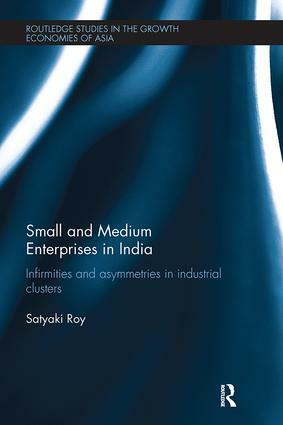 This book analyzes how SME clusters emerge in a developing economy. Using India as a case study, it addresses one central question: If growth has largely failed to be inclusive so far, and if employing a work force in increasing returns activities through a different trajectory of industrialization is largely dependent upon industrial clusters of small and medium sized firms, then what are the structural infirmities and asymmetries that need to be taken into account in the context of framing policies related to industrial clusters? The book identifies the structural infirmities in industrial clusters in India, which could be typical to any of the developing countries and sharply in contrast to European success stories. Blending theory and empirical material, it provides a middle ground between the two extremes of a uniform policy assuming ‘one size fits all’, and a specific policy based on individual cases. The book redraws the broad contours where space and production processes mutually constitute each other, giving rise to outcomes somewhat generic to underdevelopment. It is of interest to academics working in the fields of economics, business administration/ management and development economics.